Enniscorthy is a well established parkland course having celebrated its centenary in 2007. It recently attained the Fáilte Ireland Quality Assured mark. It is a full 18-hole par 72 course which offers a challenge to the expert while a pleasurable experience to the novice. 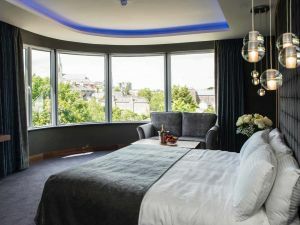 The course is situated amongst the rolling Countryside of the fertile Slaney valley on the outskirts of the Town just off the N30 New Ross road. The course bears the mark of the renowned course architect Eddie Hackett and in more recent times Jeff Howes design. Jeff designed the new 12th and 13th holes in 2009. Continuing the implementation of the Jeff Howes Golf Design Master Plan drafted for the Club some years ago, work commenced on the redesign of the 16th and 17th greens in 2012 and were completed on schedule in spring of 2013. There are excellent practice facilities adjacent to the course including a driving range, pitching and chipping areas and putting greens. 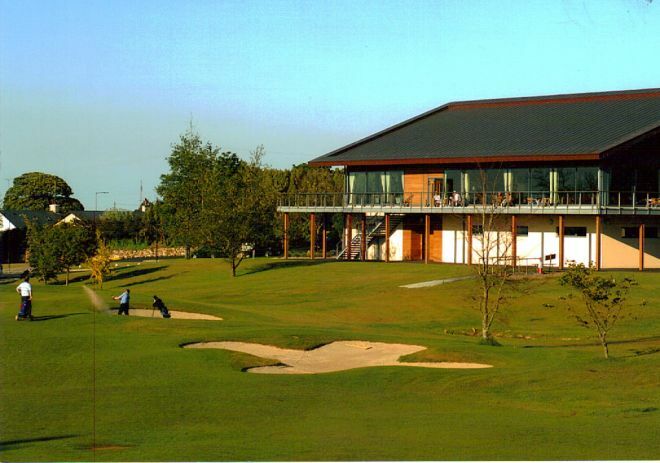 The clubhouse provides all the facilities golfers expect and more including free WiFi and catering with Á La Carte menu and daily specials in a family friendly setting. Enniscorthy people are renowned for their friendly demeanour and this is evident in the clubhouse. There is also a well-stocked pro-shop adjacent to the clubhouse with club resident professional Stephen Fitzpatrick PGA in attendance. 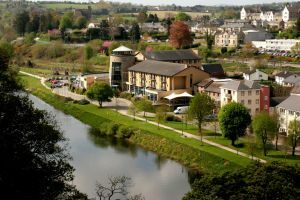 Enniscorthy offers realistically priced green fee and society rates and well as the lowest open competition entry fees. There are varied and numerous open events throughout the year and the Open Week 2013 starts July 25th to Aug 5th. John O’Sullivan, writer for The Irish Times, quoted in 1998 "Beautifully manicured and demanding golf course from the back tees" when writing about our very first Pro-Am launched in 1998. Greg Allen, from the national television broadcasting station R.T.E. stated "The extra length which has been added makes it a genuine championship course"
Calling All Golf Enthusiasts! Book your golf getaway at Riverside Park Hotel today! 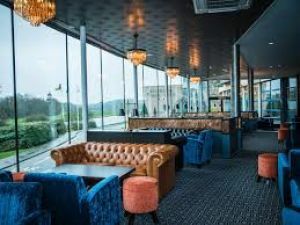 *All Dinner packages are served in our Moorings Restaurant, if the moorings restaurant is closed dinner will be served in our Alamo Restaurant. **Group Discounts are available, contact +353 (0)53 9237800 directly! Enniscorthy Golf Club won the Barton Cup in 2017 when they beat Ardee Golf Club at home on 2th September. The team on the day was Frankie Morrissey with James Morrissey who beat Thomas Malone with John Callan by 8 and 7, they were followed by Paul Lynch with Liam Sheridan who beat Paul Wisniewski with Fergal Kerr by 2 and 1, next on the tee was Martin Sludds with Shane Fortune who recordes a 4 and 3 win over Brendan Healy with Eric McKeever, the penultimate match of Richard O'Connor with Paul Conroy went up the 19th before they recorded the point against Joe McArdle with Pater Taaffe, the bottom match of Adam Jordan with Nicky Murphy against Gerard Caffrey with Kevin Carry was halved when called in. They were managed by Murt Mangan and Captained by Jack Murphy. The Ladies of Enniscorthy Golf Club were Runners-Up to Kilkenny Golf Club in the Mid-Leinster Finals of the Irish Senior Cup, played at Carlow Golf Club on Sunday 11th May 2014, when Kilkenny won by 3 ½-matches to 1½-matches, but did qualify for the All-Ireland deciders at Mount Wolseley Hotel & Golf Resort on 15th and 16th August. They were drawn against Kilkenny again in the All-Ireland Quarter-Finals on the Friday morning and were led out by Aisling O'Leary who lost her match against Mary Dowling by 3 and 2, she was followed by Nicola King who halved with Mary Leahy-Browne, next on the tee was Ciara Sharkey who lost her match against Orla Dunphy by 3 and 2, the penultimate match of Laura Dempsey went 5 and 6 to Katie Aherne, the bottom match of Jennifer King was halved with Ann Smee when called in. So it was not to be but Wexford Hurling had a great year and I am sure the Lady golfers of Wexford will be back like their hurlers. The Ladies of Enniscorthy Golf Club beat Kilkenny on the 19th Hole in the final of the 2013 Midland Senior Cup Qualifiers at Wexford, 11-12 May. After a nail biting Semi Final between Carlow and Enniscorthy which was decided on the 19th Hole Enniscorthy secured their place in the final. Mary Dowling (+1) beat Aisling O'Leary (3) 1-up, she was followed by Eileen Rose Power (1) lost to Sorcha Howell (3) on the 19th, next up was Mary Leahy Browne (4) lost out to Nicola King (4) by 2 and 1, the penulimate match say Orla Dunphy (4) beat Jennifer King (5) 5 and 4, in the bottom match Ann Smee (6) lost to Laura Dempsey (6) by 3 and 2. It was on to Portumna Golf Club to compete in the National Deciders on Friday 16th August 2013, where they were drawn against where they were drawn against Royal Co. Down in the All-Ireland Quarter Finals. First on the tee was Aisling O'Leary who halved her match against Veronica MacGreevy when called in, she was followed by Sorcha Howell beat Anita McCaw by 5 and 4, next up was Nicola King who recorded a 6 and 5 win over Emma Dickson. The penultimate match of Ciara Sharkey was halved Sinead McVeigh when called in, in the bottom match Jennifer King beat Laura McCaw by 4 and 3. They met the old-enemy Kilkenny in the All-Ireland Semi-Finals, first up again was Aisling O'Leary lost her match against Mary Dowling on the 18th, she was followed by Sorcha Howell lost to Eileen Rose Power by 2-holes, she was followed by Nicola King beat Orla Dunphy by 3 and 1, the penultimate match of Ciara Sharkey went to Mary Leahy Browne when she clinched it on the 18th, in the bottom match Jennifer King beat Ann Smee by 5 and 4. The Ladies of Enniscorthy Golf Club reached the Semi-Finals of the All-Ireland Senior Cup Championship at Grange Golf Club on Sunday 18th August 2012, when they were beaten by the eventual champions Royal Portrush Golf Club who clinched their 25th Championship with a 4-matches to 1-match result. First on the tee was Aisling O’Leary who lost out to Charlene Reid by 4 and 3, she was followed by Sorcha Howell who had a bad day against Lucy Simpson when going down by 7 and 6, next up was Ciara Sharkey who halved he match Victoria Bradshaw. In the penultimate match Nicola King lost out to Irish Close Champion Helen Jones by 5 and 4, in the bottom match Jennifer King Halved her match against Naoimh Quigg. They beat reigning Munster and All-Ireland Champions Douglas Golf Club in The All-Ireland Quarter-Finals by 3-matches to 2-matches on the Saturday. They played the same formation as in the Semi-Finals with Aisling O’Leary leading them out against Karen O’Neill who lost her match by 2 and 1, next up was Sorcha Howell who had a 2 and 1 win over Eavan Higgins, she was followed by Ciara Sharkey who had one-of-those-days when going down to Tara Gribben by 8 and 6. In the penultimate match Nicola King beat Kate MacCann by 2 and 1, in the bottom match Jennifer King beat Aoife Lane by 5 and 3. Enniscorthy Golf Club won the Leinster Final of the Barton Shield when they beat Ardee Golf Club by 6-holes- at Forrest Little Golf Club on Saturday 30th July 2011. They made the long journey to Castlerock Golf Club to compete in the All-Ireland deciders the following September. They were drawn against Ulster Champions Warrenpoint Golf Club in the All-Ireland Semi-Final. First on the tee was Mark Murphy with Jason Rackard who lost out to Paul Reavey with Stephen Coulter by 3-holes, they were followed by Graham Donohoe with James Buckley who lost out to Ryan Gribben with Colm Campbell Jnr. by 3-heles.Also on the team was Maurice Donohue, Mick Healey, Mark Murphy and Martin Sludds. Warrenpoint went on to win the Barton Shield All-Ireland Final when they beat Tramore Golf Club by 1-hole the following day. The Ladies of Enniscorthy Golf Club were runners-up in the Mid Leinster Final of the Irish Senior Cup when they lost out to Kilkenny Golf Club by 4-matches to 1-match at Bunclody Golf Club on Sunday 15th May 2011. This qualified them for a shot at the All-Ireland Finals held at Malone Golf Club on 12th and 13th August. They made their way north and were drawn against East Leinster Champions Co. Louth Golf Club in the All-Ireland Semi-Final. They were lead by Deirdre Smith lost to Aisling O'Leary 4/3 Oonagh Purfield halved with Ciara Sharkey (called in), Carla Reynolds beat Nicky King 4/3, Sarah Murray lost to Jennifer King 3/2, Nicola Reddan lost to Margaret Mooney 2/1. The Ladies of Enniscorthy Golf Club won the All-Ireland Junior Cup in the ILGU Inter-club Championship at Donabate Golf Club on Saturday 25th September 2010, when they beat Ulster Champions Royal Belfast Golf Club by 3 matches to 2 matches. The Ladies of Enniscorthy Golf Club won their Mid-Leinster Final of the Junior Cup in the ILGU Inter-club Championship on Saturday 4th September when they beat Mullingar Golf Club by 4 matches to 1 match. First on the tee was Margaret Mooney (9) against Patience Collier (12) when she had a comfortable 6 and 5 win, she was followed by Catriona Hogan (10) who won her match by the slimmest of margins against Dor O’Keeffe (13) by 1-hole, next up was Connie Doyle (10) who had a 5 and 3 win over Ann Marie Conlon (14), the bottom two matches of Stellah Sinnott (12) against Ann Grehan (15) and Cora Mernagh (13) against Brege McCarrick (15) were called-in. They made their way to Donabate Golf Club to compete in the National deciders and were drawn against Munster Champions East Cork in the All-Ireland semi-final, they were led again by Margaret Mooney (9) who halved her match against Deirdre O'Mahony (9), she was followed by Triona Hogan (10) who lost her match by 4 and 3 against Sarah O'Brien (9), next up was Connie Doyle (10) who had a 3 and 2 win over Mary B. Walsh (12), the penultimate match of Stellah Sinnott (12) was a convincing 5 and 3 win against Deirdre Harte (13), the bottom match of Cora Mernagh (13) against Martha Maher (14) was a 4 and 3 victory for Cora. They met Ulster Champions Royal Belfast in the All-Ireland Final on Saturday 25th September, first on the tee was Margaret Mooney (9) who lost her match by 4 and 3 against Janet Wilson (10), she was followed by Triona Hogan (10) who lost her match on the 19th-hole against Charmian Gifford (10), next up was Connie Doyle (10) who had a convincing 6 and 4 win over Patricia Boyd (12), the penultimate match of Stellah Sinnott (12) who had a 1-hole win against Terry Wells (14), the bottom match of Cora Mernagh (13) was a resounding 6 and 5 win against Gillian Haldane (16). The Ladies of Enniscorthy Golf Club won their Regional Final of the Irish Senior Cup in 2009 and made their way to Mount Wolseley Golf Club in Co. Carlow where they were drawn against Co. Louth Golf Club in the All-Ireland Quarter Finals on Friday 14th August. They were led by Nicky King who went all the way to the 18th before losing out to Deirdre Smith. Next up was Jennifer King who had a bad day when going down to Jennifer Gannon by 7 and 6. Next on the tee was Laura Dempsey who put the first point on the board for the Wexford team when beating Maria Dunne by 3 and 1. The penultimate match Margaret Mooney against Oonagh Purfield was halved when called-in. The bottom match of Cora Mernagh against Carla Reynolds went 5 and 3 to Baltray. Co. Louth went on to meet Royal Portrush Golf Club in the All-Ireland Semi-Final the following morning when the North Antrim ladies won by 3½ matches to 1½ matches. The Ladies of Enniscorthy Golf Club won the Mid-Leinster Final of the AA Insurance Junior Cup and made their way to Royal Tara Golf Club to participate in the National deciders in 2009 they beat Connaught Champions Athenry Golf Club by 3 matches to 2 matches in the All-Ireland Quarter Final and lost out to Munster Champions Mallow Golf Club in the All-Ireland Semi-Final. The Ladies of Enniscorthy Golf Club won the All-Ireland Junior Foursomes at Athlone Golf Club on 30th September 2007,when they beat Gort Golf Club by 2 ½ matches to ½ match. They beat Dun Laoghaire Golf Club by 3 matches to nil in the All-Ireland Semi-Final. First on the tee was Ann Nolan with Joan Millar against Teresa Gill with Josephine Cummins who halved their match, they were followed by Julie McCarthy with Pauline Byrne who won their match against Josie Collins with Celine Fahey. The bottom match of Michele Browne with Ursula Cousins had an easy 7 and 5 win over Maureen Brennan with Margaret Whelan, to clinch the All-Ireland green pennant. The Ladies of Enniscorthy Golf Club won the All-Ireland Intermediate Cup at Athlone Golf Club on the 30th September 2007 they beat Dublin City Golf Club by 3 matches to 2 matches in the Semi-Final and met East Cork Golf Club in the All-Ireland decider. First on the tee was Eimear McGrath against Caroline O'Connor and she won her match by 2-holes. She was followed by Annette Cullen who lost to Deirdre Harte by 1-hole, next up was Elizabeth Browne against Marie O'Sullivan, and Elizabeth had a comfortable 3 and 1 win over the Middleton lady. Stellah Sinnott was too good for Valerie McCarthy when she recorded a 6 and 5 win and effectively clinch the title. The bottom match of Lori Whitney against Breda O'Farrell was halved. So the Ladies of Enniscorthy celebrated the double having already won the Junior Foursomes. Enniscorthy Gold Cub won their second All-Ireland green pennant in their 99 year history on the 28th September 2006 when they won the All-Ireland Mixed Foursomes at Clandeboye Golf Club. They beat Malahide Golf Club by 3 matches 2 matches at Carton House on 13th August to take the Leinster Final. They had to take the long road to Clandeboye Golf Club for the All-Ireland Finals where they were drawn against Ulster Champions Scrabo Golf Club in the All-Ireland Semi-Finals. First on the tee were William Rackard with Stella Sinnott against Ryan Boal with Michele Mills, they won their match 2 and 1. They were followed by Cormac Martin with Jennifer King who beat Martin Moreland with Sandra McMillan by 5 and 3. They were followed by Martin Sludds with Julie McCarthy who lost to Noel Wishart with Alison Hiles by 6 and 4. The penultimate match saw Paul Gorby with Lori Whitney halve with Chris Trelfa with Hazel Barry. The bottom match saw Michael Healy with Pauline Byrne have a very convincing win over Tim Bailie with Karen Clarke by 7 and 5. They met Munster Champions Nenagh in the afternoons All-Ireland Final. William Rackard with Stella Sinnott were again first up against Jim Gleeson with Marie Scroope and again they had a 2 and 1 victory. They were followed by Cormac Martin with Jennifer King against P. J. Hogan with Marie Corrigan and they had a 2-hole victory over the Tipperary pair. P. J. Murphy with Eimear McGrath lost by 5 and 3 to David Reddan and Iris Dennison. They were followed by Paul Gorby with Lori Whitney who had a 1-hole win over Billy and Carmel Burke to clinch the match. Michael Healy with Pauline Byrne put the icing-on-the cake when they halved their match against Paddy Kennedy with Winnie Ryan. Enniscorthy Golf Club were All-Ireland Rotary winners in 1999 when the team was David Garahy, Kevin Frayne, John Garahy, David Dowling, Garry McCauley, Henry Goff and Peter Creedon. Enniscorthy Golf Club won the South Leinster Trophy, in 1999 when the team was Pat Dunne, Jim Power, Peter Creedon, Thomas Breen, Karl Cullen, Mick Kenny, John Walsh, Peter Breen, Colin Gainford and Michael Martin, they were managed by Brian Kenny. On the 17th April 2001 George Leech played 105 holes of golf at Enniscorthy Golf Club starting at 8.00am and finishing at 8.20 pm to raise funds for the Juveniles in his capacity as Juvenile Organizer, he raised in excess of £1,200 when Pat Ruddy heard of his endives he offered George 5 slots at The European Club to let the Juniors compete in their own competition won by Johnny Murphy wit 33 pts. George was well supported by the members. The Ladies of Enniscorthy Golf Club won the ILGU Midland District Midland Trophy in 1992 and 1996, when the team was Cora Mernagh, Anne Nolan, Marie Duggan, Margaret Frayne, Mary Bulger, Lucy Doyle, Anne O'Rourke and Nan Kavanagh, they were Captained by Yvonne Latta. The Ladies of Enniscorthy Golf Club won the McLoughlin Trophy in 1989 when the team was Mary Bolger, Breda Sinnott, Judy Gregan, Gillian Leo, Ann Nolan, Maura Mullen, Pearl Deane and Patricia Donnelly. Marie Duggan (16), Lady Captain 2000 and her Captain's prize winner Breda Morrison (31) qualified for the finals of the Volkswagen-Irish Independent Lady Captain's Classic at Tramore Golf Club. They came second with 42pts. and went on to play in the National Finals at Druid's Glen. There is some confusion as to when golf was first played at Enniscorthy. There is evidence to prove it was in 1906. However, The Irish Field on 22nd February 1914 reports "Golf has languished for some time past at Enniscorthy owing to the course being most unsuitable and play only allowed from December to April. Ground for a new course has been secured near the town and Mr. W. C. Pickeman of Portmarnock has been asked to lay out the course and promises to do so". The present club has no knowledge of an existence before 1925. The GUI records give an affiliation date of 1908 for the previous club. In the clubs centenary publication of 2007, the editors noted the clubs "Uncertain Beginnings" having researched documents relating to its origins. The much respected Golfing Annual, first published in 1887, a notable publication of 226 pages that grew to 760 pages by 1909 listed an entry of a golf club at Enniscorthy in its 1906/1907 edition while a later edition of 1908/1909 listed the Honorary Secretary as Mr. P.F. Roche, The Castle, Enniscorthy stating that there were 50 members. On the 13th of Jan 1908, the year in which Old Tom Morris died, an agenda for a meeting of the Golfing Union of Ireland, the oldest golfing union in the world dating back to its inauguration on the 12th Oct 1891, mentions Enniscorthy Golf Clubs’ application for affiliation. The affiliation was accepted at that meeting and the minutes indicating this affiliation were adopted and signed at the following meeting on the 19th of May 1908. The club affiliated to the ILGU in 1925. In the Golfing Annuals’ entry it also stated that ‘the course of nine holes is three quarters of a mile from the railway station’. Enniscorthy Railway Station, opened on the 16th of November 1863, is about two miles from the old club house on the N30 New Ross road, so the original course it is believed by some to be somewhere near or on the grounds of Saint John’s Manor, built on the site of a 12th century Franciscan monastery would easily be ¾ of a mile. Unfortunately, it seems that the course was most unsuitable for enjoyable golfing and could only be played between December and April so as not to coincide with the working of the land for agriculture. Prior to the First World War, an extract from the Irish Field confirms this by stating "golf has languished for some time past at Enniscorthy owing to the course being most unsuitable.."
‘Ground for a new course has been secured near the town’, according to a report in the heretofore mentioned Irish Field of 1913. A Mr. W. C. Pickman who laid out the plans for the original nine hole course at Portmarnock in 1894 was asked to lay out the course and he promised to do so. This land was leased, and it is not really known why the purchase was not completed until 1970. The first part of a two-part program got under way in that year to improve the course, and from then to the present day, due to the dedication, generosity and hard work of many Officers of the club and the members, the club thrived. In 1975, it was proposed to build a new two-storey clubhouse. Following the decision on plans, layouts and tendering, the clubhouse was finally opened in December 1976, and officially opened by Pat Foley, President G.U.I, in June 1977. 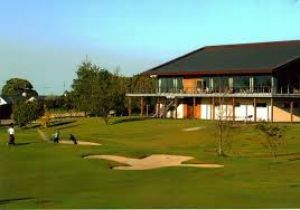 First indications of plans to extend to 18 holes comes from the minute book of 1982, where it is recorded that a sub-committee of trusted members was formed to investigate the possibility of purchasing additional land. At an EGM, in the same year, a report from Mr. Eddie Hackett, R.I.P., Golf Course Architect, stated that the land to be purchased was suitable for golf, and would yield 7 holes, two others could be got on the existing course, thus giving 18 holes. A decision was made at the AGM of 1987 to go forward with the construction of the new nine holes and under the stewardship and direction of the late Jim Whitney, a man of great vision, persistence and stamina. Unfortunately, serious illness struck Jim in that year and he died in June 1988 but he is remembered each year when the Jim Whitney Shield is played for. His death was a great loss, but an admirable successor, Ted Morrissey, famed for his role with St. Dympna’s in the 1957 Junior football final against the St. Martin’s, took up the mantle of supervision and direction. Progress on the development was so good that on May 28th, 1989, the 18-hole course was played for the first time. With some additions of land, changes were inevitable to improve the layout. Both Eddie Hackett and Pat Ruddy, (European Club), both oversaw various changes during the 90’s to give us the course we enjoy today. In 2005 additional land was purchased to improve the course by the addition of two new holes and the addressing of various ‘safety’ concerns. Mr. Jeff Howes, Golf Course Architect, undertook this planning during 2006 and completed the project in 2007. The two new holes are now in play and are an excellent addition to the Course. We trust you will enjoy the efforts of so many dedicated golfers and friends, those who are still with us and those that have gone to their eternal reward who gave so much to the development of the course as we know it today. If you would like to know more about the history of Enniscorthy Golf Club, Enniscorthy Town and its people, the limited edition centenary publication "Enniscorthy Golf Club 1907 – 2007" is on sale and can still purchased in the '98 Commemorative Centre and at the bar in the clubhouse, or alternatively contact the club for details on how to acquire a copy.